Most working days Australia’s ABC TV European Correspondent Rafael Epstein rides his bike from his home in North London to the ABC office near Regents Park. His 10 kilometre journey is captured by dozens of cameras, as are millions of other Londoners. Almost every move you make is being watched – and privacy is fast becoming obsolete. ABC TV’s team of Foreign Correspondents take you on a unique journey to places few others venture, for a colourful look at the culture and lifestyle of people who don’t usually make international headlines. Their mixture of serious and light-hearted stories will inform and entertain you. 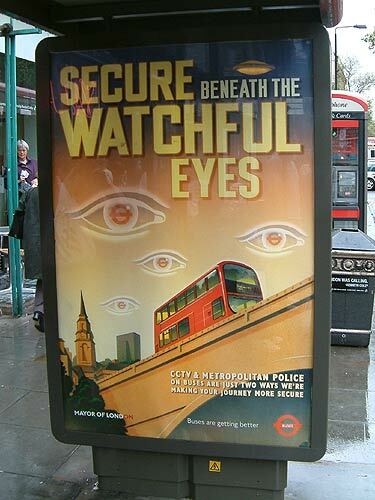 Orwell would be proud; I know it’s popular to compare domestic surveillance to 1984, to Ingsoc … but for good reason. I totally agree with you forrest…We may be surrounded everywhere by survillence cameras but is it for our own good when our privacy is at a a huge risk ? The more power you give the state, the more risk there is it will be abused. Did you guys see the film “Enemy of the state”? Although I’m not really sure how and when the whole idea with CCTV started I tend to think that it’s classical example of taking something that was originally benevolent idea that had good justification into something completely different, and I dare to say wrong, by pushing it to extreme if by nothing else then the shire number of cameras. People tend to be more receptive to giving away some of their rights in times of crisis which is understandable, but somehow it proves to be very hard to get those rights back when crisis is over. If any of you have been to England you will notice a huge amount of cameras pointed in every direction. Too many in fact. I think i like vinston said they were brought in as both a deterant and to deter. Unfortunately it the local councils that have gone way over board with the cameras. I agree with them being in area like town center high streets as you get a lot of pick pocketing during the day and fights in the evening. Although they will not initially stop the crime at least you have some chance of catching the criminal. I don’t agree with them being on every street corner and in the recent case in Birmingham pointed towards a particular sector of the community. This is just spying and should not be allowed. Finally though if we are feed up the constant intrusion we can always head for the countryside.